This image taken during a wedding reception at Paletta Mansion in Burlington on the shore of Lake Ontario is me of the images that brides absolutely adore! The best part about this images that this is 100% candid wedding photograph. During the wedding photo shoot the groom took a seat on the fallen tree trunk. The bride just sat close to him and rested her head on the groom's shoulder. I asked my assistant to position the strobe light to camera right and I waited until the bride closed her eyes, blinded by the intense sunlight. Sometimes a wedding photographer gets lucky and this is one of those moments. 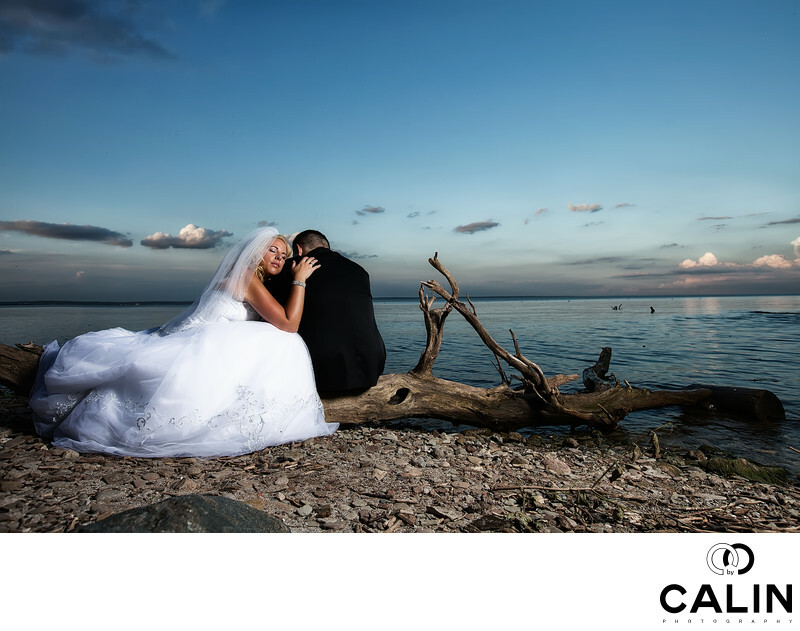 Everything worked perfectly in this shot: the beautiful blue sky, peppered with textured clouds gives this image a romantic note. The shore follows the diagonal in the photograph so it gives the image a certain dynamism that is difficult to explain, yet it is apparent. The groom's face is not shown which creates an aura of mystery in the image. Also, the fact that the bride looks so peaceful makes this photograph a happy shot. The bride and groom are placed at the intersection of two leading lines: the horizon line and the tree trunk one. Arguably, the horizon line is placed exactly in the centre of the frame which does not follow the rules of composition, namely the rule of thirds. However, the image works and sometimes you can break photography rules when the situation dictates it. In post processing I adjusted the white balance and did some beauty retouching. I finalized the image by applying dodging and burning to emphasize the bride and groom. Location: 4250 Lakeshore Road, Burlington, ON L7L 1A6.